My boys are both petrified of the vacuum at home, whenever I contemplate having a quick run around with it, I have to declare it loudly so they can both jump onto the sofa for 'protection'. I'm not sure if it's the noise, or the thought they have to tidy their toys away for me to do it that scares them, but alas, they don't like it. Their requests usually vary from asking me not to do it (believe me I would take them up on that if I could) or to sit with them on the sofa whilst I vacuum and while I pride myself on my ability to multitask - I'm not quite that good sons. 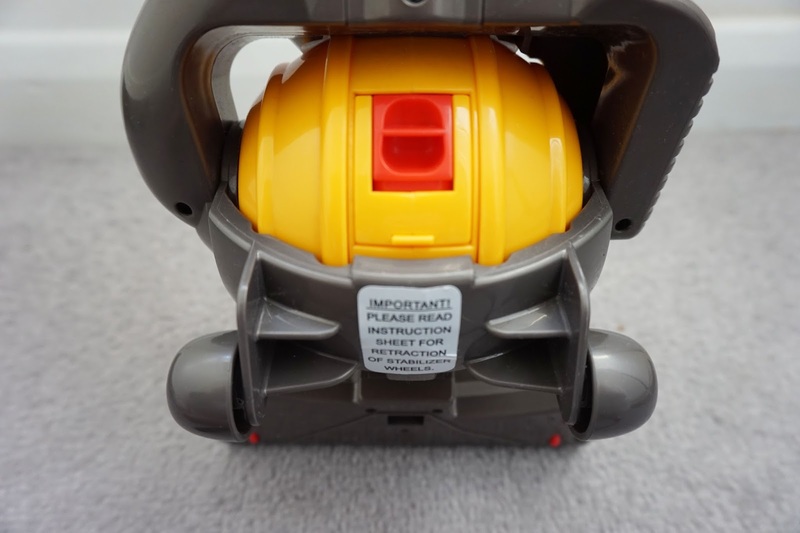 So, when I was kindly asked if I'd like to review the Casdon Dyson Vacuum of course I jumped at the chance, I'm a real firm believer in learning through play and whilst this isn't your ordinary educational toy, it's definitely helped learn my boys that there is absolutely nothing to be afraid of when it comes to vacuuming. First impressions were great, the vacuum looks completely the part. 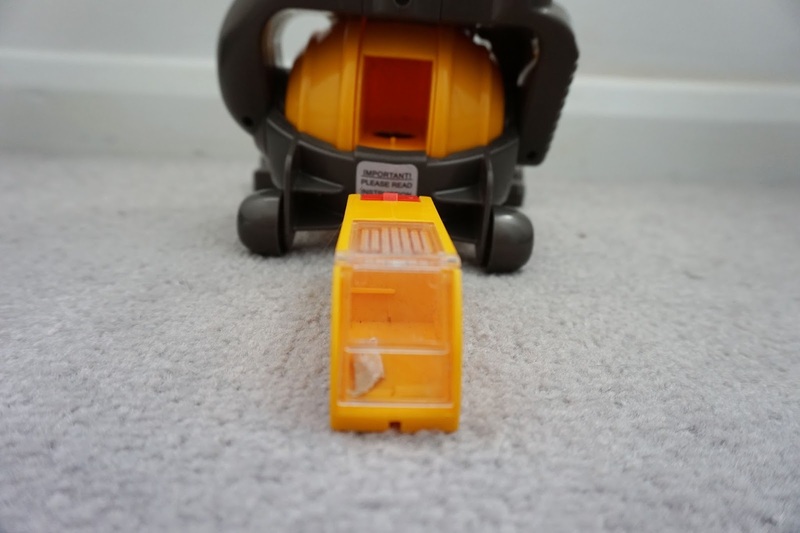 My Mum actually owns the 'real life' version and it is an exact like for like which for children is a real novelty as it's allowing them to feel a little more grown up and the restriction of not being able to play with the actual vacuum is almost lifted when they have their very own miniature version to waltz around with. 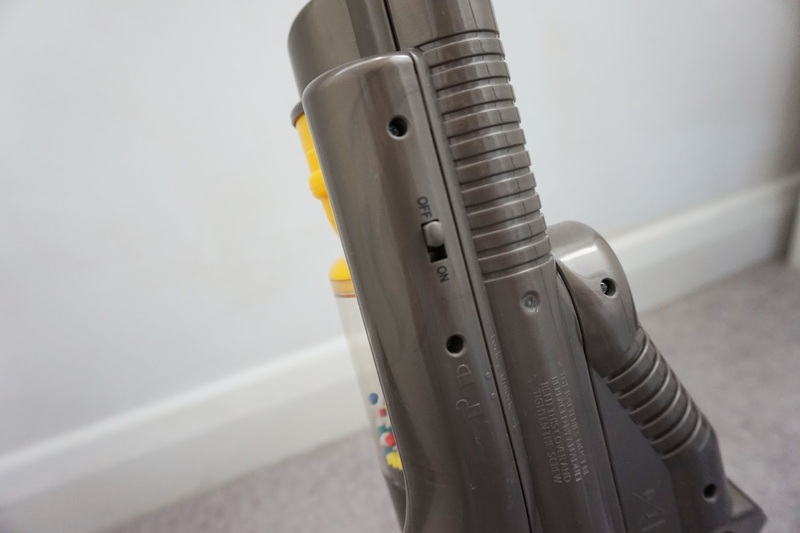 The Casdon Dyson Vacuum does require 4 'c' batteries, we found these no trouble in our local bargain store, though it is worth knowing in advance as it wasn't the type of battery we had lying in our kitchen drawer. I was relieved to see that the vacuum was already kitted out and put together, it really was a simple case of inserting the batteries and having a flick through the information sheet to see how everything worked. Quick and easy, which when you have little ones around you prising the toy from your hands, is a huge bonus. 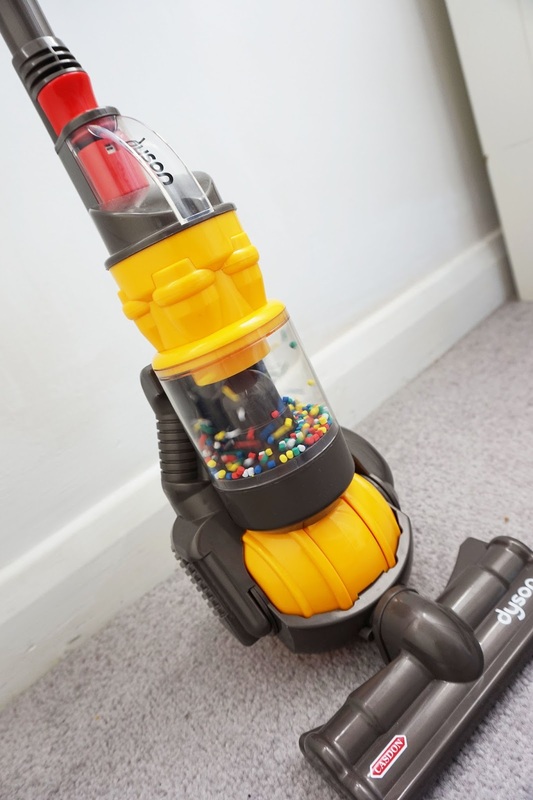 The features really sucked me in, I didn't realise before hand but the vacuum actually has suction, meaning they can truly help with the chores. Now I'm not saying throw away your current vacuum and just set the little ones to work, but it definitely picked up some little bits and pieces from our carpet. Noah was thrilled and spent most of the morning it arrived checking the filter to see what he'd 'collected'. 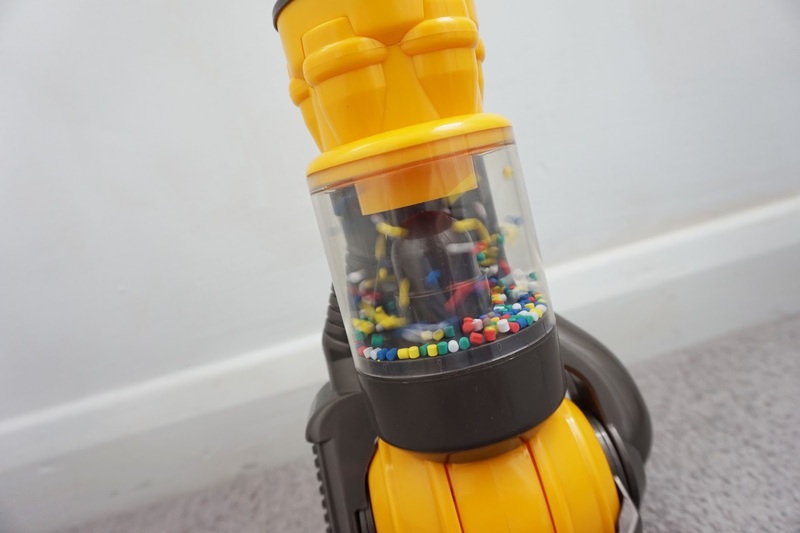 I was impressed, right there and then within the space of a few hours Casdon had taught my son that vacuuming was fun, and whilst that might not be a life lesson that sticks around through his teenage years, it's definitely one he wouldn't have thought, had we not had the Dyson Vacuum. Before we unveiled the toy, he would be scrunched up on the sofa and yet here he was rushing around the house with his very own vacuum. That isn't all, the vacuum has realistic sounds - so much so my other half came downstairs at 7:30am last weekend, ready to question why I was hoovering at such a ridiculous time. The look on his face when he realised it was the boys with their new toy was priceless. There's also a little switch which sets the cyclone off inside the vacuum, it's filled with colourful balls which Patrick, my youngest, adored watching spin around. The cyclone function works without the noise and suction if you wish, which I think is great if you have a child that likes to have a 4am wake up occasionally like ours do, as the sound is that realistic it's probably best to exercise that option sometimes. I have to admit and testify for the toys robustness, though I'm sure it hasn't intentionally been designed to withstand throw downs and being trodden on, it has definitely experienced them in our household and of course tussles, one new toy and two boys was sure to cause a few arguments. But, the Dyson vacuum withstood the test with ease and that is no easy achievement with my two rumbustious souls. 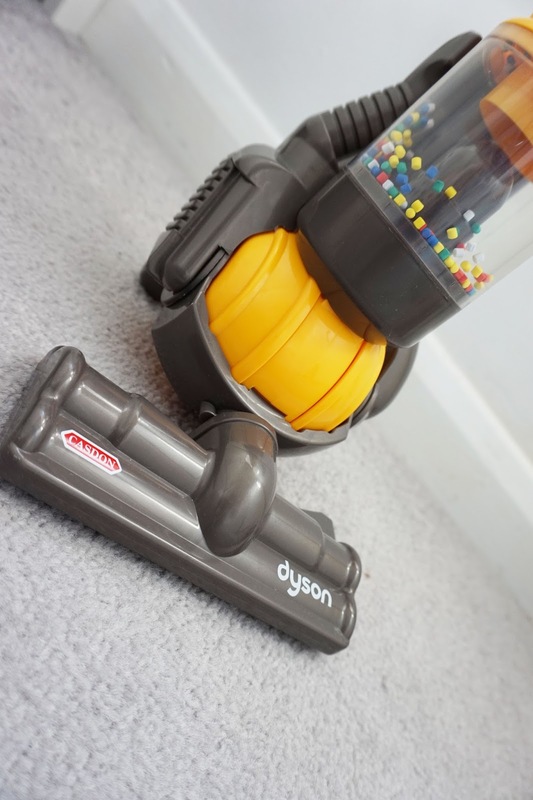 Overall the Casdon Dyson Vacuum gets a big thumbs up from us, there hasn't been a day since it's arrival that the boys haven't opted to play with it and if it all we got from it was that vacuuming is fun and not to be feared - then I'm one happy mother. There is a wide range of other life like toys available from Casdon, ranging from Little Helpers, to Little cooks and Little shoppers. The Casdon Dyson Vacuum retails at £17.99 . *This is a review in which we were gifted the product in exchange for our honest opinion. Oh this look great, my daughter hates when we vacuum too - I am not sure why! I reckon she would love her own vacuum to play with and it's great to hear that this one is so robust! My youngest daughter got this a couple of years ago and she still loves it now! We have a very similar one which we got Poppy for Christmas and as soon as as get our Dyson out she will follow us round with hers. I agree about them being robust too. She's banged it on the kitchen floor loads and it's not yet broken!! My kids love anything like this and I love the fact it actually picks up stuff too!! My daughter loves helping me with the hoovering so this is definitely something I'll be looking at come birthday time so she can follow me along. Ahh this is fab! My kids would adore one the same as Mummy's! I think we would need it to be a little more robust by the sounds of it though, haha! I NEED this Harrison! We bought a Henry hoover for him and it’s absolutely adorable, but of course it doesn’t look like mummy’s hoover so it’s no use to him at all! I wont lie, I am gagggggging over this hoover. Actually, any hoover. We seem to have a rug from hell that we have to hoover every other day as it just sheds everywhere and I get so obsessed with the floors being clean and we have a rubbish hoover! This looks like it could stand 5 mins around her as she's so heavy handed haha! This is a rating that was used primarily for marketing purposes and had little or no relation to vacuum cleaner performance in the real world. Thankfully, it has been largely done away with as a vacuum cleaner specification. This is not just a mere piece of work. This is ART. All the things in the blog are conveyed so elegantly.